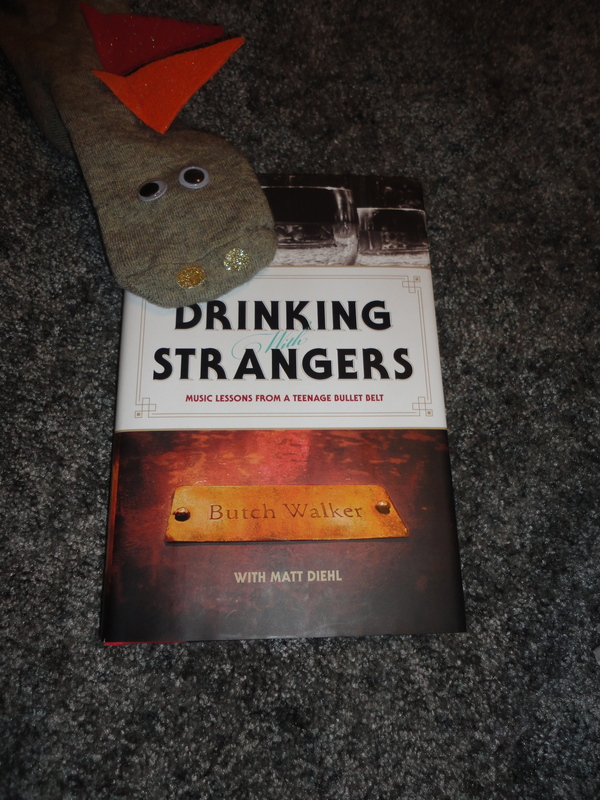 Frank Reads: Drinking With Strangers by Butch Walker | Frankasaurus. So, I’m sure you’ll be shocked that I agree with Frank’s assessment of this book. It’s a fun read, especially if you’re interested in the music industry and how it works. To that end, if you’re interested in the vast differences between working with a major label and going the indie route, this book is full of information about that. Most of all, though, I like stories. You know when you just sit around with a group of friends and tell stories? I love that. It’s a good way to bond with people. My stories (and certainly the stories of people I know) don’t involve the likes of Nikki Sixx or Tommy Lee. They don’t involve late shows or martial law in China. But I have stories. We all have stories. I look at Butch’s friendship and dynamic with Pink (whom he refers to largely by her actual name — Alecia), and I see a guy with a wife and a son who is best friends with a woman who has a husband and a daughter. And everything’s just peachy. I love their whole relationship and dynamic and find it somehow very reassuring. They’re supportive of each other and respect each other so much. I don’t think you see many friendships like that anymore, much less between [married] men and women. Nothing shady about it. I like it. In what was perhaps my favorite part of the book, one of my personal stories overlapped with something significant for Butch. I kind of just stared at the page for a while and thought… that explains it. In late 2002, Butch did two solo acoustic sets at Jammin’ Java, this very small, intimate venue in Northern Virginia. As it turned out, my mom worked with someone who was just as obsessed with Butch’s music as I am, so he and I ended up road tripping and going to both of the shows. One was a night or two before Thanksgiving, and one was a few nights before Christmas (Dec. 22, 2002, if memory serves). At the second show, Butch sat down to play a song called “If (Jeannie’s Song)” from what was then his current album (his first solo album). I remember him apologizing ahead of time and saying something like, “I’m sorry if I don’t make it through this one. I got a phone call before the show tonight….” and sort of just left it at that. The song is about cancer and is very touching. And indeed, he got just into the song and appeared for all the world to be crying. No one in the crowd said a single. word. We all just watched him crying and singing and going through whatever he was going through. Definitely something you don’t get with your arena performances or pre-fab pop stars. This was very much all about raw emotion. In the book, Butch talks about Jeannie, who was Nora’s (his wife) mother. He talks about how close they’d all become and how much he loved Jeannie. Around that time, it became clear that her battle with cancer was coming to a close, and it was understandably hard on Nora, who had also lost her father to cancer. He tells this story of going to visit Jeannie with the family the night before she passed away. When it was his turn to say goodbye, he whispered in her ear that he was going to ask Nora to marry him. The following morning was Christmas Eve. Jeannie passed away. Nora’s brother gave Butch the ring that Nora’s dad had given Jeannie, and on Christmas morning, Butch proposed. That means that the whole time he was performing that show for us, that was all going through his head. He could have canceled the show for a family emergency. He could have played a listless set and walked out early. We would have understood. But he’s Butch Walker and he didn’t. He gave that set 150% and it was probably one of the best live shows I’ve ever been to. Everyone in that room could feel what he felt. The music came alive, as cliche as that sounds. He even stayed afterwards and hung out. We talked to him for a while. When I went back to college the following semester with the news that my grandmother had been diagnosed with cancer, I listened to that song a lot. I was a member of an on-campus group that was holding a public poetry reading in a local coffee shop. In addition to a piece of original work, I also read the lyrics to this song, thinking… I’m not sure what I was thinking. I remember looking up at my friend’s face, watching me reading, and then suddenly feeling like I was going to cry in front of all of those people. It was so quiet. I couldn’t make it work like Butch did. I’m not much of an actress and don’t possess that kind of talent when it comes to showmanship. I wear my heart on my face. That night, he had too. It just worked better when he did it. Back to the book: It definitely enhanced my reading to have a part that I could say, “I remember when that was happening.” I love those stories (though I wish it weren’t such a sad one). If there’s one criticism I have, I just wish the editor had done a better job. I mean, I get it. As a writer and an editor, I know it’s easy to miss things. You get burnt out on reading. But there were some inconsistencies (Pink’s name changing from Alecia to Alicia and back, for example) and some time frames that seemed to overlap, and I had to wonder why no one ever picked up on that. It’s the former English teacher in me. I get hung up on details (I’m so square). Still — just minor things in an otherwise great read. I promise to try my hardest to have something new again next week! Until then… be well, Frankophiles.